Forever Active Pro-B™ Probiotic tablets Intestinal flora, FLP610, 30 Stk. Base price per 100 g: 394,51 €. Hydrolysiertes Maisdextrin, Fructooligosaccharide, Überzugsmittel (Hydroxypropylmethylcellulose), Bifidobacterium lactis, Lactobacillus rhamnosus, Lactobacillus reuteri, Trennmittel (Magnesiumstearat, Siliciumdioxid), Lactobacillus acidophilus, Bifidobacterium longum, Bifidobacterium bifidum, Farbstoff (Titandioxid). 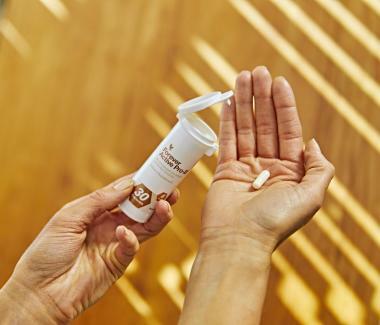 Designed to promote a healthy digestive system, Forever Active Pro-B™ includes a proprietary blend of 6 different probiotic strains and provides 8 billion CFU per dose. 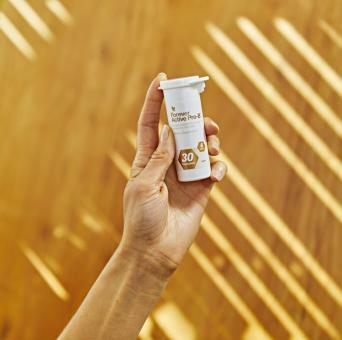 The vegetarian capsule is packaged in a unique vial that uses Activ Vial Technology™ to control moisture absorption and protect the probiotics throughout their shelf-life. Forever Active Pro-B™ uses an exclusive, cryo protection technology that protects the probiotics during manufacture and throughout shelf-life, and the probiotic strains themselves have been selected and engineered to have high resistance to stomach acid and bile salts allowing them to reach the intestine. Clinical studies have shown these strains have a greater ability to colonize and proliferate and survive the passage of the GI Tract. 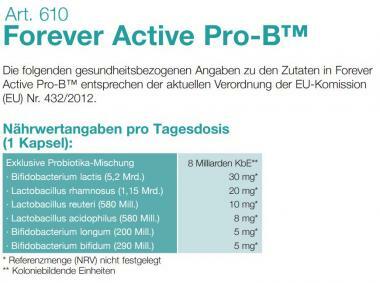 Datasheet : Forever Active Pro-B™ Probiotic tablets Intestinal flora, FLP610, 30 Stk. (PDF) -> Open in a new window. Show product video for Forever Active Pro-B™ Probiotic tablets Intestinal flora, FLP610, 30 Stk.